Spaces are heated with warm water circulated in tubes embedded in concrete floor plates. 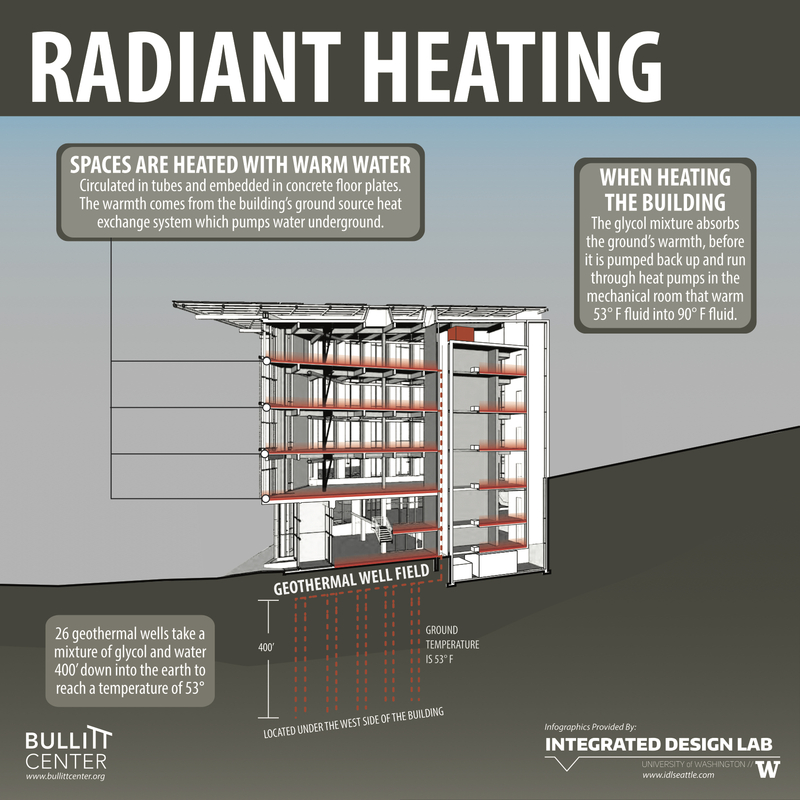 The Bullitt Center is heated (and cooled) by a dense system of veins, or hydronic radiant tubing that coils a few inches beneath the concrete overlay of each floor. Formally known as “cross-linked polyethylene”, the tubes are commonly called PEX. Inside the tubes, a special mix of water and glycol run quickly, warming or cooling the concrete slab, which efficiently radiates into the occupied spaces. 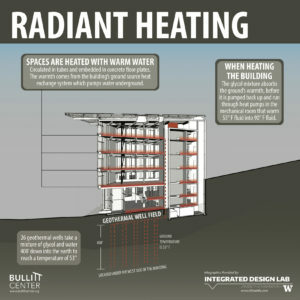 The source of the heat for the radiant system actually starts 400 feet below the Bullitt Center, where twenty six geo-thermal wells dive 400 feet below the building. This ground-source heat pump uses a closed-loop tube containing a mixture of water and glycol that receives and gives off heat quickly to the surrounding soil and groundwater, which remains at a constant temperature of 53 degrees F.
When heating the building, the glycol mixture absorbs the ground’s warmth, before it is pumped back up and run through heat pumps in the mechanical room that warm 53° F fluid into 90° F fluid. In the winter, the system removes heat from the ground. In the summer, the system can be run in reverse, restoring this heat back into the ground. In this sense, the ground is used as a “battery” for heat. The geothermal well field is under the west side of the building, in an area with a constant lens of groundwater moving slowly toward Puget Sound. As a result, any “heat pollution” from the wells dissipate within approximately 12 inches. Since the Living Building Challenge requires all of the energy used at the Bullitt Center to be generated onsite, it was critical to use an energy efficient heating and cooling system. While electric resistance heating is the cheapest and most direct way to heat a building with electricity, it is incredibly inefficient. In contrast, the hydronic system uses relatively little electricity – which is consumed mostly to run a compressor – to exchange heat from one place to another with amazing efficiency.